Since starting to reload 9mm I’ve been having some issues with ammo getting loaded that sticks in the chamber of a couple of my guns. I originally thought that this had to do with the somewhat “fat” ogive of the bullets I’m using so I began to load them a bit shorter, and shorter trying to back them off of the rifling a bit so that they wouldn’t stick in the chamber anymore. I originally started loading 9mm at 1.14″ OAL, and then started shortening them down, all the way to 1.10″ but I was still getting rounds that would stick in the chamber. I picked Ben’s brain about this over the weekend while he was over working on some other things, and we noticed that somehow I’m getting some brass that’s coming out of the sizing die a little short (.740″ instead of .745″-.748″) but that doesn’t seem to be the problem. At this point I have about 400 rounds loaded at 1.120″ and I painstakingly chamber checked all of them in the new Glock 34. I ended up with about 5% of the rounds that would stick in the chamber for no apparent reason. The rounds slide 90% of the way in, then they meet some resistance, and get stuck. Other rounds with the same length brass, same exact overall length (even some that I loaded quite a bit longer) drop in and pass a plunk test without issue. I suspected that I may have gotten a batch of bullets that hadn’t been sized, but quickly ruled that out by measuring 100 of them at the base and they were all a perfect .356″ in diameter. Being that the rounds drop into the chamber most of the way before meeting any resistance I began looking at the bullets themselves (125gr Blue Bullets) and it appears that for some reason or another some of them are catching the rifling at the front of the chamber, even when others loaded exactly the same length, and some others loaded a good bit longer don’t stick. I’ve pulled the bullets from the rounds that stick and the ones that don’t and they look identical, and measure up perfectly so I’m not inclined to blame the bullets. What I did do though was take one round that was sticking and very carefully scrape the coating off of the lead around the case rim. It passed a chamber check after doing this. For some reason that I have yet to figure out, some of these bullets catch and stick, and others don’t. I found that if I load them all down to 1.10″ OAL they all pass a chamber check, and they seem to shoot fine without any pressure signs, so I’ll probably blast through the rest of these loaded short and try another projectile in the future. Has anybody had a similar issue with coated lead projectiles? I’m still pretty new to reloading, and I can’t seem to find a difference between the bullets that stick and the ones that don’t, so I suspect it’s more likely something that I’m doing, and not the bullets themselves. I’ve loaded several thousand Bayou Bullets that have a similar coating and never had that issue. I’ve even loaded them on 3 different presses. (Lee and Dillon). I’ve never loaded Blue Bullets to compair. I had this problem once upon a time. A)Try a little more case flare before bullet seating.. Too little tends to scrape the bullet and leave a little ring of lead/coating around the case mouth when seating. B) If that doesn’t solve the problem, try crimping separately after seating the bullet. 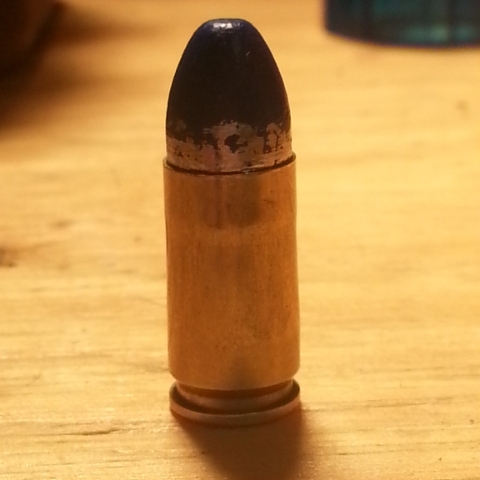 Some dies tend to crimp too early while the bullet is still being seated. I think this happens more w/ 9mm because of the case taper. Try a Lee factory crimp. 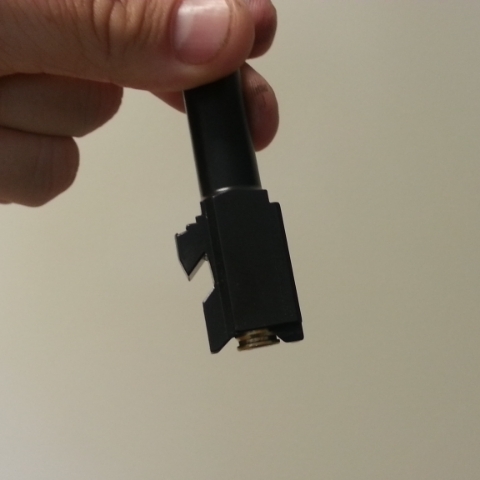 It resizes the loaded bullet while adding the taper crimp. X2 Joe in Reno. Flare the brass a bit more. Check the crimp after. Thanks, I’ll try that. In the beginning I was flaring so much that the case didn’t want to go into the seating die, so I backed it off a turn, I’ll turn it down a bit further and see what happens. If you are flaring the brass so much, it won’t go into the seating die, case flare is not the problem. Spent a little time fiddling this morning. I backed off the seating die a bit to it mostly seats and doesn’t do much to remove the bell, then I adjusted the FCD to remove the last of the bell. I loaded 100 this morning at 1.10″ and they all chamber checked fine. I think I’ll just have to go really short with these bullets until I shoot them up. Fired 10 of them earlier in the week at this length, and there were no pressure signs on the brass, so that’s good. I had the exact same issue with a batch of 125 FP Bayous. We were also loading them at 1.125. They would chamber in an older Gen 3 26, VP9, 229R, and a Sig Traditonal 1911. They would not chamber in my brand new 19. I didn’t figure this out until I got to the range and absolutely locked up my 19. I had to go back and shorten all of them up to 1.10. Would like to know if you figure out another solution. I’m wondering if something has changed with Glocks chambers? I just realized this was a two year old post. Sorry about that. Did you end up just keeping everything at 1.10?